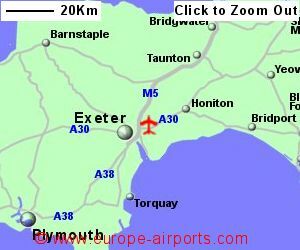 Exeter Airport is located 8Km East of Exeter, close to the M5 motorway, south west England. All car parks are within 750m of the terminal building, the furthest being serviced by a shuttle bus. There is a bus service between the airport and Exeter city running approximately every hour through most of the day. 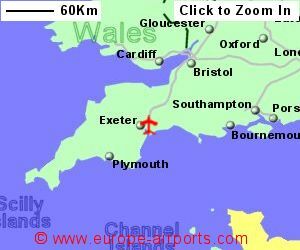 Exeter airport has 4 bars/restaurants, 3 shops, a bureau de change, an ATM, and an executive lounge with free WiFi. 908,000 passengers used Exeter airport in 2017, an increase of 7% compared to the previous year.